Home Tags Posts tagged with "marathon 39 weeks pregnant"
Amber Miller, the 39 weeks pregnant woman who ran the Chicago Marathon. Amber Miller, a 39 weeks pregnant woman from Illinois who was expecting her second child any day, set off to run the Chicago Marathon. According to Chicago Tribune, as Amber Miller, 27, neared the final stages of the marathon, contractions kicked in. But the brave Amber Miller continued the race regardless, half running – half walking, and she managed to cross the finish line in 6 hours and 25 minutes. 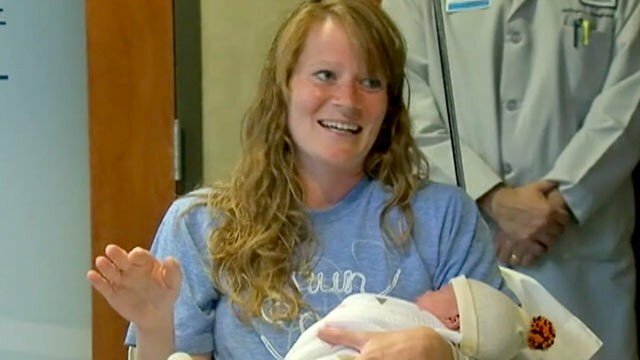 After few hours after she completed the marathon (26.2 miles) on Sunday, Amber Miller gave birth to her daughter, June Audra. The Chicago race was not really the baby June’s first marathon, as her mother, Amber Miller ran the Wisconsin Marathon earlier this year, when she was four months pregnant. Amber Miller also ran another marathon when she was about four months pregnant with her son, Caleb, now 19 months old. The 27-year-old runner’s time was just three hours off her personal best. Amber Miller began having contractions near the end of the race, but says she is not sure if it was labour, because she typically feels some contractions when she runs while pregnant. Her husband drove Amber to Central DuPage Hospital in Winfield where she gave birth to the healthy 7 pounds, 13 oz baby. “The race was definitely easier than labour,” Amber Miller said at the end of the day. The pregnant woman decided to run because she and her husband, Joe Miller, had already signed up for the race. Amber Miller got the approval from her doctor and says she experienced a enthusiastic welcome from crowds as she ran along. Amber Miller told TV station she had ran regularly throughout her pregnancy and marathon organizers had not interfered in her decision to run. Amber Miller’s daughter was born at 10:29 pm on Sunday night after seven hours labour and she is in “excellent” shape, according to the neo-natologist at the hospital. Doctors said the greatest risk to mother and baby was dehydration, which could have sent her into premature labour. However, Amber Miller was in excellent physical shape when she ran and had already carried the baby full term.